Many facilitators realize that the basic methodologies they use often fail to take their clients to a place of deeper learning and growth required when addressing complex issues. This book offers over seventy exercises, along with tips and tools for expanding the professional coach's repertoire and includes a full range of interventions. The book also includes step-by-step guidance on how to use these innovative methods with clients. 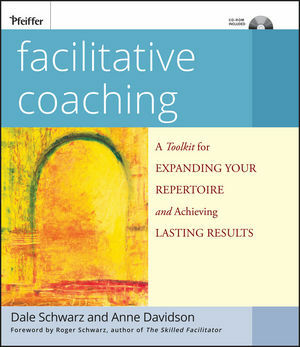 Based on the Skilled Facilitator model developed by best-selling author Roger Schwarz in his landmark book, The Facilitative Coaching Toolkit is ideal for coaches who are looking for advanced alternative approaches to helping their clients get "unstuck" when dealing with obstacles. Dale Schwarz is a personal and professional coach, art therapist, and workshop leader. For over thirty years, she has guided individuals to fully use their gifts and talents to transform their lives. In addition, she helps coaches expand their repertoire and skills and provides organization development consulting to both public and private sector clients. Dale is the co-founding director of the Center for Creative Consciousness and an associate with Roger Schwarz & Associates. Anne Davidson specializes in leadership development, facilitator training, and long-term organizational and community change projects. Anne brings twenty-five years of experience to her international work with executives, management groups, work teams, and nonprofit and local government boards. She coaches individuals in creative development and in applying The Facilitative Leader approach. Anne is a consultant with Roger Schwarz & Associates and co-author of The Skilled Facilitator Fieldbook.